I always knew a PhD would involve hard work.... But I didn't realise quite how frequently I would feel like a piece of washing wrung out by a Victorian clothes- drier.... I am used to unexpected things cropping up that put my experimental plans in disarray but this week has been exceptionally difficult! For my PhD project, I am investigating if infection with parasitic plants ( especially Striga species) makes the host more vulnerable to above ground pathogens. For my model system , I am using Arabidopsis thaliana ( thale cress) as the host and Striga gesnerioides as the parasitic plant. 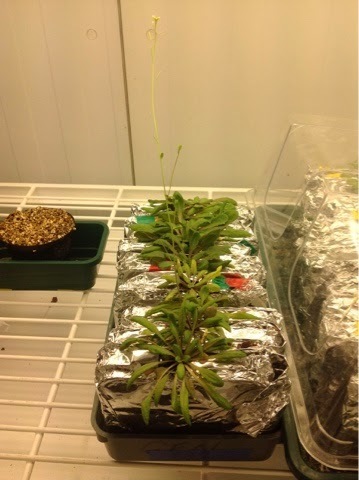 I was very excited as this week I was due to challenge my first batch of Striga- infected hosts with downy mildew ( this is done by filling a perfume spray bottle with a solution containing downy mildew spores and spraying it as a fine mist over the leaves!). 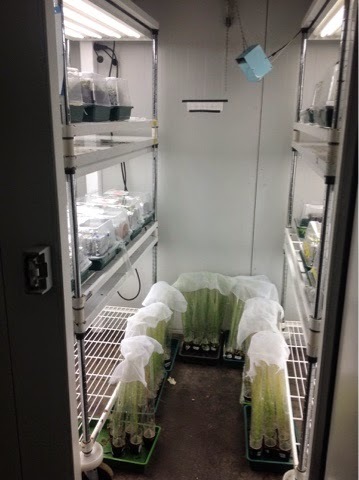 I had already prepared a living culture of downy mildew on a different host, ready to use when I came to challenge the Striga infected plants. First problem- the living culture wasn't producing spores so I had to find some elsewhere. Someone had a culture but it was ready to sporulate RIGHT NOW and not in two days time, as I had planned! So it was a rush to prepare to infect my plants. Second problem - my Striga- infected hosts were flowering! This was bad news as when Arabidopsis starts to flower , it stops putting so much energy into making leaves and I needed nice big leaves to score the extent of downy mildew infection. Fortunately I managed to scrape together enough non-flowering plants for a viable experiment. 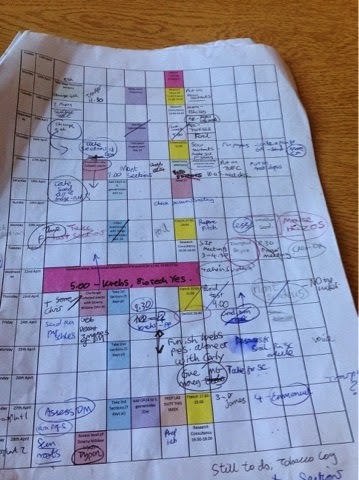 My current experimental plan... You can see how often it gets changed! But why WERE they flowering? My cabinet was supposed to be set to a short photoperiod ( 9 hours of 'daylight') so the plants should think they were in the middle of a ( mild!) British winter...I asked the technicians to check and , yes, the photoperiod was definitely 9 hours. So what was going on? ... And there was precisely what you do NOT want to find first thing in the morning! A chain of emails between my supervisors and the growth room technicians, all with 'URGENT' in the title. My growth chamber had completely broken - the temperature system had conked out. So that's why the plants had started to flower! My supervisor was away at a conference so it was up to me to move all my plants into temporary quarters. It was a mad dash to tell the lecturer leading the practical what had happened, then a sprint to the growth rooms to move my plants out. I was just in time - you could feel the heat coming out of the chamber, they were being cooked! With the help of the technicians, I managed to find some temporary lodgings for them and just made it back in time for the practical. By the time the lunch break came, a new growth cabinet that was currently empty had been found so I went back to move my plants in. I took several thermometers with me and have taped these to the walls - I'm not going to be caught out again! Fortunately, the practical - despite involving undergraduates, mealworms and beetles- went fairly smoothly with the students not as squeamish as I thought they would be! Lesson learned - don't trust what computers or people tell you - listen to your plants. They never lie! The plants never lie... This cabinet is definitely NOT 'winter conditions'! Happier plants in their new growth cabinet - although the shelves are at a different height than the previous one hence why some are on the floor!